1) You are better off. 2) It’s a mile (1600 metres) swum in open water of temperatures of five degrees Celsius or lower, wearing only standard swim costume and cap. It’s pretty much as least as horrible as it sounds, and in probably worse. It’s governed by the International Ice Swimming Association founded in 2009 in South Africa by five swimmers. The goal for the IISA is to have the Ice Mile introduced to the Winter Olympics. In retrospect the best time for me to have done an ice-mile would have been the previous winter of 2009/10 when I was training for the English Channel and doing a lot of cold water and the Association had just been founded but unfortunately my time machine is temporally out-of-order. (Gee, I wrote a time machine joke.). I’m going to put an important disclaimer and reminder here early on, and a subject to which I will return. I cannot stress these enough. An Ice Mile requires experience, training, planning and safety and support personnel. An Ice Mile should not ever be attempted casually, and for most people should never be attempted. The temperatures here in Ireland are marginal in two ways: For most of the year the temperatures are such that only experienced open water swimmers are comfortable in our cool water. The other margin is that the cold winter sea temperatures usually hover about six degrees Celsius, just above the prerequisite five degrees to allow an Ice Mile attempt. Therefore any Ice Mile attempt in Ireland usually requires co-operative (cold) weather and there are only a few usable locations, the most suitable of which are cold mountain lakes. As those who read this blog last winter will recall, English and earliest-and-coldest-ever North Channel swimmer Fergal Somerville hosted on an Ice Mile attempt at Dublin’s North Wall in February of 2013. We didn’t get the necessary temperature, and I suffered significant post-swim hypothermia due mainly to a then-recent weight loss of almost six kilos. I’m not a big person anyway so that was not insignificant weight loss. I turned down another opportunity just a week later to join others of my good friends and personal heroes Finbarr Hedderman, Ciarán Byrne and Rob Bohane in an Ice Mile swim in the Kerry Mountains. 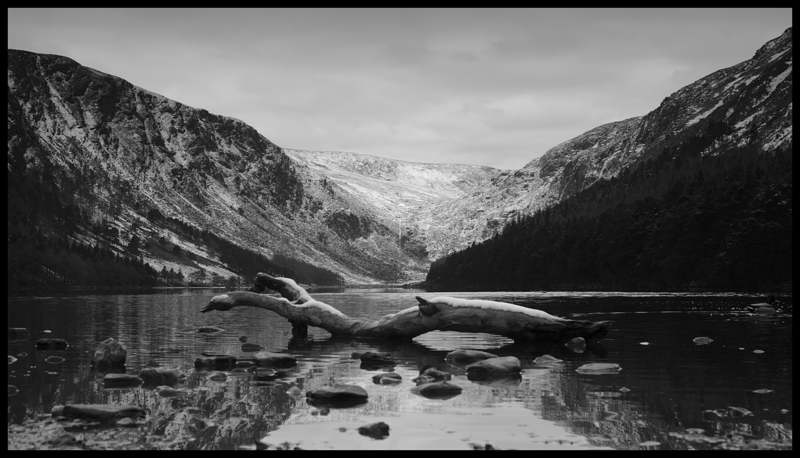 A few weeks later Fergal again hosted another Ice Mile attempt, moving location to Lough Dan in the Wicklow Mountains. That day in 2013, surrounded by snow and ice, my mind mostly elsewhere, I decided against swimming the full mile, ans swam half the distance, partly because of the very low temperatures; one point four degrees through surface ice at the lake edge. And partly because I was just wasn’t at all mentally engaged for personal reasons that weekend. I remember saying to Dee that I didn’t have it in me that day to mentally go where I would need to go in order to complete the mile. Indeed I wrote here afterwards: “most importantly, I knew I was unwilling to dig into the mental reserves I knew I’d have to access in order to complete. I know how to find and access those mental reserves for swims but [knew they] would come with a physical price. And I also know that sometimes pushing myself too far isn’t the wisest thing to do”. That day Fergal, Colm Breathnach, Patrick Corkery, John Daly and Carmel Collins all completed the swim and became Ice Milers, all excellent cold water swimmers. Taken at Glendalough Upper Lake, hours after the 2012 Lough Dan Ice Mile. It was unexpected that afterwards people both commiserated with me and congratulated me on my decision, even at the CS&PF Channel Dinner in the UK. I wasn’t at all bothered by not doing the swim and was happier with making a personal educated decision to not swim the full mile, (despite irresponsible pressure from one swimmer). I made that decision based on knowing myself; my experience, my physiological state and my thought processes. One year later, in this 2013/2014 winter, which isn’t as cold as last year’s bitter season, Fergal and The Eastern Bay Swim Club once again decided to host an invitation-only Ice Mile attempt in Lough Dan high up (relatively speaking, our mountains are low) in the Wicklow Mountains. The actual date stayed flexible to allow for weather and temperature changes. but the third and fourth weeks are usually the coldest water temperature here. The date was finally fixed one week beforehand and I indicated I’d accept the invitation and made my final decision to go only 24 hours beforehand. But honestly, with the milder temperature, I certainly did not think we would have the necessary low temperature, nor did most of the other attendees. And I wasn’t at all bothered. A swim at six degrees would suit me fine and I’d be hypothermic afterwards anyway. Now let me say, and this is also important and key to this whole thing, that I’ve changed my mind about the Ice Mile challenge over the last couple of years since Finn and I first discussed it, starting before last year’s attempts and solidifying early last year. I was no longer particularly interested in the challenge for myself. I’ll get into those thoughts about the Ice Mile challenge later in this series. So this was the context of my first dilemma. I write about cold water swimming. It’s my favourite subject, my favourite palette, and my articles on the subject (index on top right of the page!) 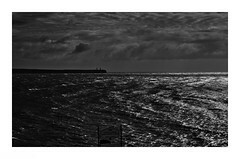 are part of what define Loneswimmer.com. I love cold water, love that bite. But it’s Hobson’s Choice: We don’t have warm water here so it’s cold water or no water, love it or leave it. I also believe in trying to help educate about open water and cold water swimming’s dangers and benefits. And specifically, I also know that I like cold water, down to about six degrees Celsius (42.8° F). Sure, I can and have, swum in water of five degrees and colder. But I don’t (always) enjoy it. The balance of reward versus difficulty doesn’t really work for me unless I also reduce the time commensurately. At five degrees, 15 to 20 minutes is fine. (For me). At four degrees, I don’t like swimming longer than 12 to 15 minutes. I also don’t want to increase my weight significantly, nor do I want to push the swimming time limit weekend after weekend, as I would need to do and have previously done, to increase my cold tolerance. For most of the coldest winter months here, I generally swim anywhere from twenty to forty-five minutes depending on the day and conditions and month. I want to enjoy it, to explore my own mind while doing so, to feel what inspiration may come. But there’s an increase in attention to the International Ice Mile Association and the numbers doing Ice Mile swims are growing, particularly in such areas of regular cold water swimming as Ireland, the UK, South Africa and the northern latitude American continent. I started to feel pressured. “How can we take Donal’s writing on cold seriously? He’s not even an Ice Miler“. It was a mental construct and a trap entirely of my own making. Sure, I knew it for the fancy that it was. But I couldn’t shrug it off and I still felt I needed to do an Ice Mile, if only for the sake of my existing cold water writing, rather than any particular desire to achieve the target. We do this, us stupid swimming apes, build imaginary mental obstacles and make them real, and sometimes impossible. I’m a master at it. Allied with this was another dilemma, what I think of as The Paul Kimmage Effect. Paul Kimmage was a Irish professional cyclist in the late eighties and early nineties. He was not successful and retired quickly and wrote a very good expose of his experience and the drug culture of cycling, including his own use of prohibited substances. He later became one of the long-term key anti-Lance Armstrong journalists and subject to one of Lance Armstrong’s more famous and vicious attacks. Because Kimmage (of whom I am a fan) had not been successful in his cycling career and because he had exposed something that many cyclists didn’t want discussed, he was heavily criticised and even disregarded. There are aspects of this challenge that I wanted to write about that I felt could be disregarded if I myself had not completed the challenge. Ironically, I had built that trap myself by completing the half mile swim last year. Had I said up front that I wasn’t at all going to even attempt that swim and proceeded from there, subsequent discussion may have been easier as I’d have just been an educated observer and commentator. Otherwise I’d have been one of the people who didn’t or couldn’t do it. So this really felt like a Catch 22. I didn’t particularly want to do it, but I felt I would probably have to do it sometime.